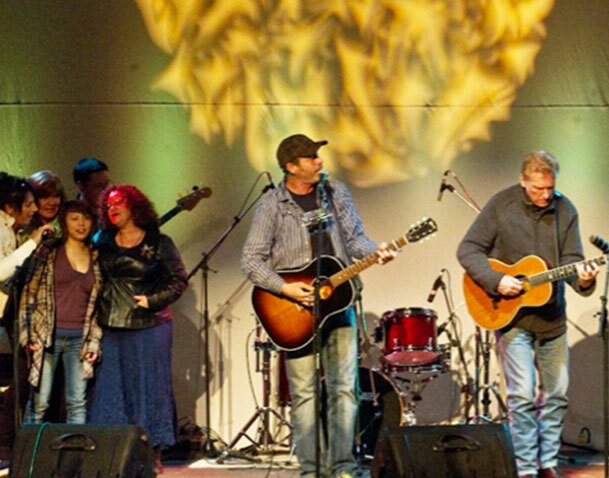 Barney Bentall has been a longtime supporter of Peter Gzowski Invitational events, particularly as a performer for events in the Northwest Territories and Nunavut. Bentall is a Canadian pop/rock singer-songwriter who is best known for his 1990s-era band, Barney Bentall and the Legendary Hearts. Their most successful Canadian singles included “Something to Live For”, “Life Could Be Worse”, “Crime Against Love” and “Come Back to Me”. Peter Gzowski founded the PGI Golf Tournaments for Literacy to raise funds for literacy programs and to inspire Canadians to celebrate literacy. Thanks to performers such as Bentall, the PGIs are the most successful literacy events in Canada, generating more than $14 million since 1986. Barney was awarded a 30th Anniversary Peter Gzowski award in honour of his many years of support and dedication to literacy and the PGI events.